The manipulation-based complementary and alternative medicine (CAM) therapies assessed for headache include acupuncture, acupressure, dry needling, chiropractic manipulation (spinal manipulative and mobilization therapy), massage, craniosacral therapy, and reflexology. Several other complementary therapies discussed include aromatherapy, hydrotherapy, daith piercing, and hyperbaric oxygen administration. 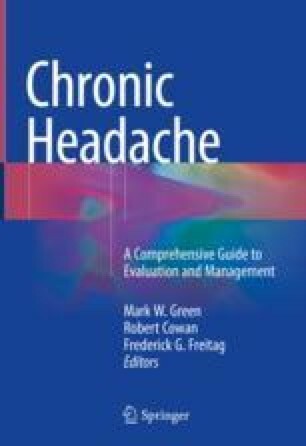 The strongest evidence for acupuncture is for chronic migraine, and cost analyses suggest it may have overall cost benefit, but methodologic concerns of the research limit interpretation and generalizability of results. There is some evidence for spinal manipulative therapy for chronic cervicogenic headache or chronic tension-type headache, but most chiropractic studies also have major methodologic limitations. The potential for major adverse events, such as cervical dissection or stroke, limits more widespread recommendation for use. The limited data supporting the use of massage, craniosacral therapy, reflexology, aromatherapy, hydrotherapy, daith piercing, and hyperbaric oxygen treatment for chronic headache conditions precludes any recommendations. Dr. Wells is supported by the National Center for Complementary and Integrative Health of the National Institutes of Health under Award Number K23AT008406. The content is solely the responsibility of the authors and does not necessarily represent the official views of the National Institutes of Health. We gratefully acknowledge the editorial assistance of Karen Klein, MA, in the Wake Forest Clinical and Translational Science Institute, funded by the National Center for Advancing Translational Sciences (NCATS), National Institutes of Health, through Grant Award Number UL1TR001420. We also thank Mark McKone, Librarian at Carpenter Library, Wake Forest School of Medicine, for his help with the use of Zotero. We are appreciative of the help from Nakiea Choate from the Department of Neurology at Wake Forest Baptist for her administrative support. Gardner K. Dry needling in physical therapy [Internet]. [cited 2017 Mar 8]. Available from: http://www.apta.org/StateIssues/DryNeedling/. Haas M. Cervicogenic headache dose-response [Internet]. clinicaltrials.gov. [cited 2017 Jun 30]. Available from: https://clinicaltrials.gov/show/NCT01530321. Chaibi A. Is chiropractic spinal manipulative therapy an efficient treatment option in cervicogenic headache [Internet]. clinicaltrials.gov. [cited 2017 Jun 30]. Available from: https://clinicaltrials.gov/show/NCT01687881. Does daith piercing really work? : First anecdotal study of its kind [Internet]. The daily migraine. [cited 2017 Feb 4]. Available from: http://www.thedailymigraine.com/blog/2016/3/1/does-daith-piercing-really-work-first-anecdotal-study-of-its-kind. Does daith ear piercing help with migraines? [Internet]. [cited 2017 Mar 6]. Available from: http://www.acupuncture.org.uk/public-content/public-ask-an-expert/ask-an-expert-neuro-and-psycho-logical/ask-an-expert-headache/4974-does-daith-ear-piercing-help-with-migraines.html.